Welcome back to another week of Fantasy baseball. We’re into late-April now, still in the embryonic stages of the season, but time’s a ticking for you to establish your team as a contender. Use that wire! This week, the A’s have locked up slugger Khris Davis for an additional two years with an extension worth $33.5 million; Boston got more bad news with Dustin Pedroia‘s knee sidelining him yet again; and Cleveland prospect Will Benson became the first minor leaguer to smack four homers in a game since 2014. 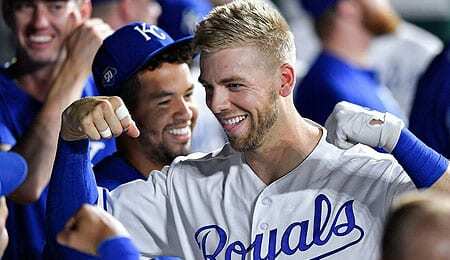 Hunter Dozier, 3B/1B, Kansas City Royals (ESPN: 21.2 per cent; CBS: 36 per cent): Before his 0-for-4, three K performance Thursday, Dozier had enjoyed multi-hit efforts in six of the previous seven games. He doesn’t offer any speed, but has shown a massively improved batting eye, helping him score plenty of runs for a team that’s offense has been better than expected. Dozier has already spanked five homers and driven in 10 runs (including the walk-off hit in the video below), and the former first rounder is looking very much like a late bloomer. He’s got serious raw power and a strong throwing arm but questions remain about his fielding prowess and ability to hit for average. Dozier had pressure to succeed given his draft slot; perhaps his injury-riddled 2017 sent him off course a bit, but he’s definitely back on track now. Hey, better late than never! Yoan Lopez, RP, Arizona Diamondbacks (ESPN: 0.1 per cent; CBS: 1 per cent): The Snakes have struggled for years to find a consistent closer year in and year out. Could Lopez be the long-term solution? Currently, he’s providing nice value in holds leagues, and has tossed scoreless ball in nine of his 10 outings to begin the season. After looking real good in an eighth inning role late in 2018, Lopez has already matched the number of games he appeared in last season, and if he can control his overpowering heat, he definitely has the potential to close down the road. Patience will be required as he has very little experience above Double-A. The Twins currently rank 20th in bullpen ERA, prompting many to believe that Craig Kimbrel is bound to sign there. But proven late-inning arms Matt Magill and Addison Reed will soon be healthy to provide a boost. While everyone is giving props (deservedly so) to Pete Alonso, how about another rookie first baseman that’s opening some eyes? Arizona’s Christian Walker continues to impress with his late-inning heroics, smacking a two-run homer on Wednesday to help the Snakes sweep the Braves. All six of his homers have come in the seventh inning or later. Thanks to rain, Corey Kluber‘s Friday start was pushed back to Saturday. Perhaps the extra day of rest will do him well as he’s been very inconsistent early on, alternating sharp outings with horrific ones. April has been his worst month in recent seasons, so feel free to try to buy low on him. The Orioles are 8-12, which is actually better than most expected, but the problem is, they really have no help coming in the near future. Cedric Mullins, one of the youngsters expected to help lead the rebuild, is in a 1-for-32 skid, dropping him to .089 on the season. If he can’t hit his way out of a paper bag, it’s going to be another long summer in B-More. After looking meh in his first start and then getting shelled in his next outing, Cubs starter Kyle Hendricks has been much better. Even though he lost again against the Braves in his third start, he was decent, but on Friday, he hurled seven shutout innings at Arizona, fanning a season-high 11 to earn his first win of the season. The Cubs’ rotation is starting to roll, kids. Atlanta’s Julio Teheran has also looked quite inconsistent so far, although he’s coming off probably his best start of the season. His walk rate soared to a career high last year, and hasn’t improved much this season; that will need to be addressed if he’s going to keep his spot in the rotation. In College baseball, No. 22 Texas was upset by Baylor on Thursday. A single by catcher Shea Langeliers started the Bears early on. He was projected to be one of the top picks in this year’s draft, but has slipped thanks to injury. Still, Langeliers is a name to tuck away for dynasty league owners. Ketel Marte‘s power game has emerged this season, but at what cost? He’s whiffed twice in each of the past two games (and five times over the last three) as his K rate has soared. That’s dragged his average down, so Marte is now under .240 for the season. Is Charlie Blackmon finally over his early season struggles? He’s gone 3-for-9 with two walks in the first two games of this Phillies’ series, hitting a game-winning two-run homer on Friday. Last season, Blackmon lost 140 points of OPS, but this year, he’s fallen off a cliff, dropping by 230 points so far. Perhaps rock bottom has arrived and he’s on his way back. Gio Gonzalez plans to exercise his opt-out clause on Saturday, so the Yankees will have 48 hours to decide whether to bring him up to the majors or set him free. He was signed to add depth to a rotation missing CC Sabathia and Luis Severino, but with Sabathia back now (and pitching well), and Gonzalez getting shelled at Triple-A, chances are Gio will be sent on his way. Now it’s your turn. Let us know in the comments below who your favourite Fantasy baseball pickup of the week is. Several teams are off to surprisingly good starts, but among NL teams — other than the Padres — perhaps no club has opened more eyes early on than the New York Mets. Pinder is looking like a decent Fantasy option — especially in DFS play (against lefties) while his salary is low. He’s hit safely in five straight games, and the first four of those were all multi-hit efforts. Pinder is showing some impressive power, doubling in three straight and homering three times so far this season, helping making up for a lack of speed. He doesn’t walk, but he’s not striking out, either, and best of all, he’s finally showing he can hit righties a bit better (.269). Pinder may still be a utility player, bouncing around the field, but he’s getting lots of chances to start this year and the way he’s playing he could cement his role early on. Robinson is putting an exclamation mark on a fire rookie season, scoring in double figures in each of the last four games, recording two double-doubles and just missing another pair. On Sunday, he played a career high 38 minutes while putting up multiple blocks for the 28th straight game. Robinson is averaging a double-double with 2.8 blocks and 1.1 steals over the last 10 games. Although we identified him early in the season, it really took until February for him to start consistently seeing enough minutes to become a Fantasy staple, but he’s been a real asset since the All-Star Game, getting to the line more often and doing a way better job on the glass.